NASA's Mars Reconnaissance Orbiter spotted the trail from an oblong boulder (bottom right) that rolled down a slope on the Red Planet. The image was taken on July 3, 2014. NASA has a case of Mars rock and roll ... literally. 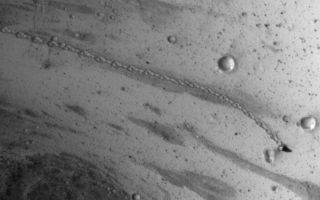 The agency's Mars Reconnaissance Orbiter currently orbiting the Red Planet has spotted the trail left behind after a tall boulder tumbled down a Martian slope. The Mars rock's misshapen prints are clearly visible in the spacecraft's view from orbit. While NASA unveiled the MRO spacecraft's black and white view of the rocky road on Wednesday (Aug. 13), the image was actually captured on July 3. NASA's Mars Reconnaissance Orbiter snapped this view, showing the the trail left by a rolling boulder that tumbled down the side of a slope, on July 3, 2014. "The boulder's trail down the slope is about one-third of a mile (about 500 meters) long," NASA officials wrote in an image description. "The trail has an odd repeating pattern, suggesting the boulder could not roll straight due to its shape." Scientists used MRO's High Resolution Imaging Science Experiment, or HiRISE, camera to take the Mars boulder photo. The space agency's Mars Reconnaissance Orbiter launched to space in 2005 and has been orbiting the Red Planet in 2006. The spacecraft has beamed back some amazing images of the Martian surface including pictures of the Spirit rover and Viking landers. NASA's probe has also witnessed dust devils and avalanches from its place in orbit. In October, MRO will also have a chance to monitor Mars' close brush with a comet set to fly by the Red Planet. NASA has started to adjust the orbits of spacecraft at Mars to prepare them for their encounter with Comet Siding Spring and ensure that they will be safe from any ill effects that could be caused by the comet. NASA's MRO and Odyssey are both currently in operation orbiting Mars. The space agency's Mars Atmosphere and Volatile Evolution spacecraft, better known as MAVEN, is on its way to the Red Planet and will arrive before the comet's closest approach. NASA's Curiosity and Opportunity rovers are also functional on the Red Planet.